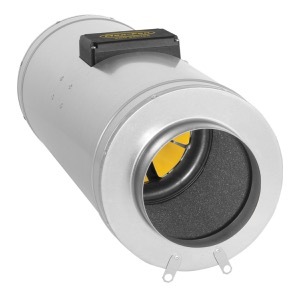 Q-Max incorporates the appreciated German made Max-Fan Pro Series, part of the Can Fan range, into a sound insulated metal casing. This unique combination provides you a very quiet inline mixed flow fan and the best aerodynamic efficiency. With its patented 3D rotor-stator system, the Q-Max conveys significantly stronger air volumes at medium to high pressure values. The silent operation of the Q-Max is the result of the high quality insulation of the metal casing, the uniform turbulanece free air flow and the smooth three speed control. The entire range meets the mandatory ErP requirements for all EU marketed fans.